Pipe guides are necessary to assure that the thermal expansion of the pipeline is properly directed into the expansion joint and to prevent buckling of the line. Additional guides located adjacent to the expansion joint are necessary because of the inherent flexibility of the bellows and the compressive loading on the pipe caused by the pressure thrust of the expansion joint. 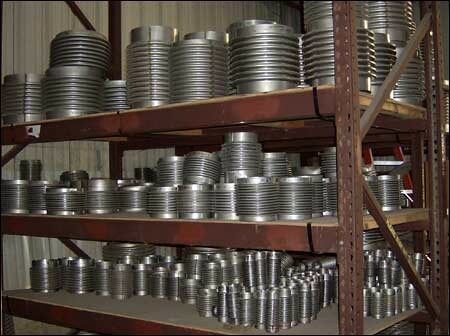 U.S. Bellows has an inventory of over 1500 stock bellows for your quick-turn/emergency requirements. 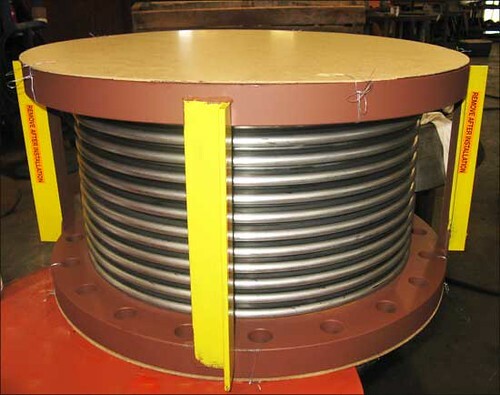 Using our inventory, we can quickly assemble and ship a variety of expansion joints including single, single tied, universal, elbow pressure balanced and in-line pressure balanced expansion joints. Stock bellows are available from 2″ to 24″ diameter and in three pressure values: 85 PSIG, 150 PSIG, 300 PSIG. The single flanged metallic expansion joint was manufactured from 304 stainless steel bellows with carbon steel flanges. It has a diameter of 20″ and an overall length of 15″. It will be used in an exhaust duct application in a power plant. A hydro-test was performed prior to shipping to Orlando, Florida. Externally pressurized expansion joints are suited for piping systems that require large amounts of axial compression or extension. In externally pressurized expansion joints, the bellows elements are arranged so that the media flow is on the external surface of the bellows. 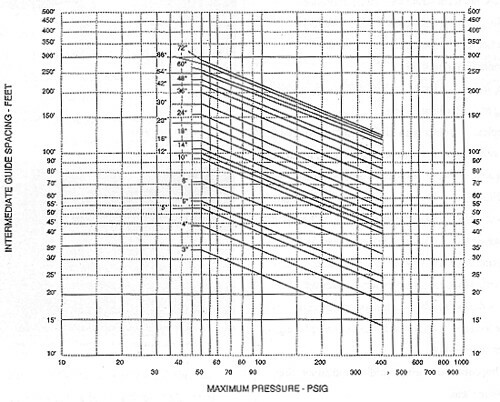 Externally pressurizing the bellows eliminates pressure instability as a limitation to the design and permits the absorption of large amounts of axial expansion. Start-up / Shut down: movements produced between the minimum ambient temperature and the maximum start-up temperature. This is normally a very low number of cycles. Operating: movements produced due to temperature fluctuations during system operation. This is typically a very small movement for a very large number of cycles. Excursion: movement resulting from a worst case / upset scenario, occurring during system operation. This is normally a very low number of cycles. 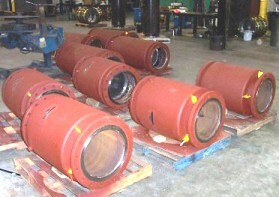 U.S. Bellows externally pressurized expansion joints are designed for 1000 cycles for any one tabulated movement shown. 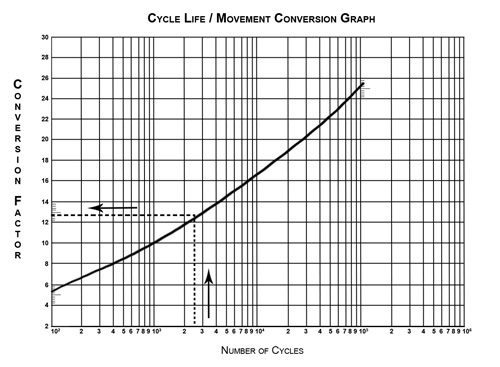 Movement may be increased, decreasing the cycle life, by using the graph below. This graph may also be used for superimposing more than one movement condition on the bellows at one time. Fill out our quote request form for more information on our products or services.